Coscojuela de Sobrarbe should be on any road map worth the name. 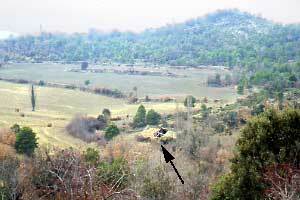 Look for it a short stretch southwards from L'Ainsa. The aceitero can be seen in the valley north from the village. 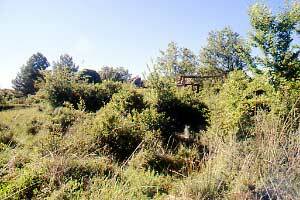 It is only a few steps from the village downwards. The easiest route is prob­ably along the pylons and then to the left when you reach a broader path. 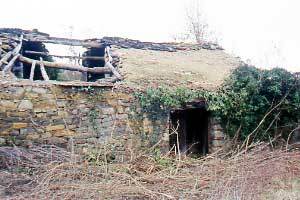 On the way down You'll find the old communal washing place —in a shameful state of neglect just like the mill. 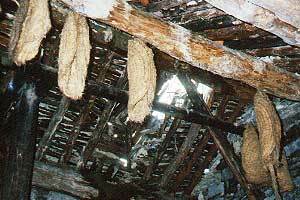 The mill —back then in 1996 already— was in a very poor state. The construction was recently cleared of shrub and most of the protective stone layer of the roof (the losas) was removed (1). I pre­sume some­one needed them for the roof of a second resid­ence. It had the advantage that we could enter the workplace rather easily via the front door (2). Nature took its rights and in 2010 it was a spiny task to work our way to the door which was hidden behind a huge wall of thornbush (3). We got through with some difficulty and were badly hurt by both the spines and the view. The years had taken their toll. The roof is now entirely on the floor and it's all mould and putrefaction that reigns. 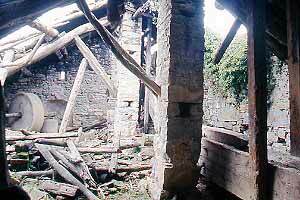 Nothing less than tragic in view of the fact that the aceitero of Coscojuela de Sobrarbe is declared a heritage site and listed in the Catálogo de Patrimonio Arquitectónico y Etnográfico of Aragón (See Decreto 26/2010 of Aragón's Government of 23.II.2010). The catalogue features two mills more and a short lookup of our visit reports shows that being on this list is no guarantee for a decent existence (†). 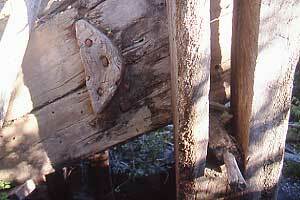 As with many olive-mills, there is a high wall on the back to accommodate de press. The front with the wooden gate is much lower. 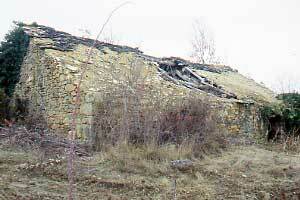 About one fourth of the roof and the back-wall must have come down quite long ago. 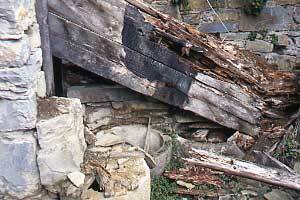 The rest of the roof stripped of the protective flat stones probably didn't last long after our visit in 1996. Beams stick out and poles point in all directions and this, together with all the rubbish on the ground, makes navigating through the workplace a bit risky. 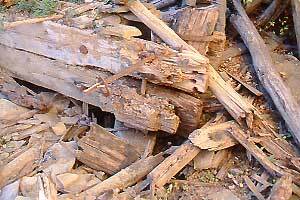 One of the main points of interest is the balsa with ruello (6). 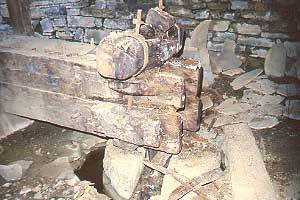 Most of this contraption which was used to crush the olives is more or less intact even in 2010: a complete row of border stones and a good wheel with its axle. The funnel —that is a box of wood normally mounted on the same axle and which purpose it is to deliver a steady stream of olives to the balsa— is missing though. You can find a nice specimen in the mill of Troncedo. The wheel was usually turned around by an animal. The free space around the balsa was probably a bit too narrow and to remedy the problem kind of an alcove was carved from the wall (7, 4). 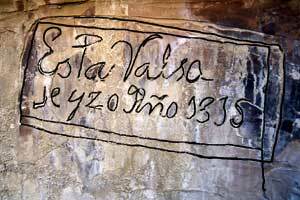 A boxed text is scratched in the plaster (8): Esta valsa se yzo Año 1815 (This olive crusher was made in 1815). 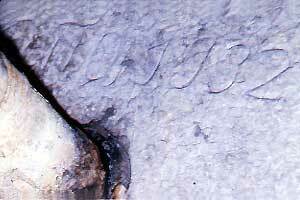 The ruello, that is the stone wheel, is engraved with 1932 (6, 16). 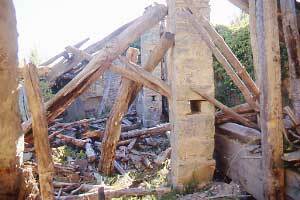 The mill of Coscojuela is one of the very few which features a prensa de libra (i.e. the place consuming version with a long and heavy beam). 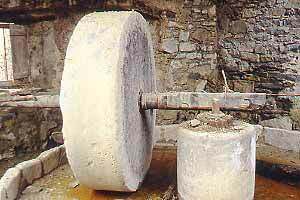 A specimen in much better shape can be seen in Castilsabás, or closer in Trillo (press handling explained). The original poles with handle (14) which served to control the height and the pivoting of the mean beam are still in place, but they are in such a poor condi­tion that they probably won't live another year. 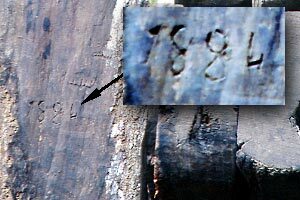 Several parts of the machinery are marked with a date. At the back end of the press, both supporting beams each feature a year mark. 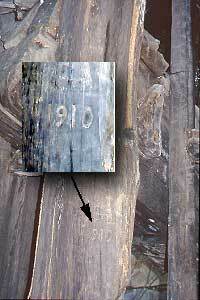 The left (looking at the head) one says 1884 (15) and the pole at the right mentions 1910 (17). They probably mark when mayor repairs to the equipment were necessary. A literature reference states that the press at some place carries the year 1796 (‡). I can't confirm its existence. 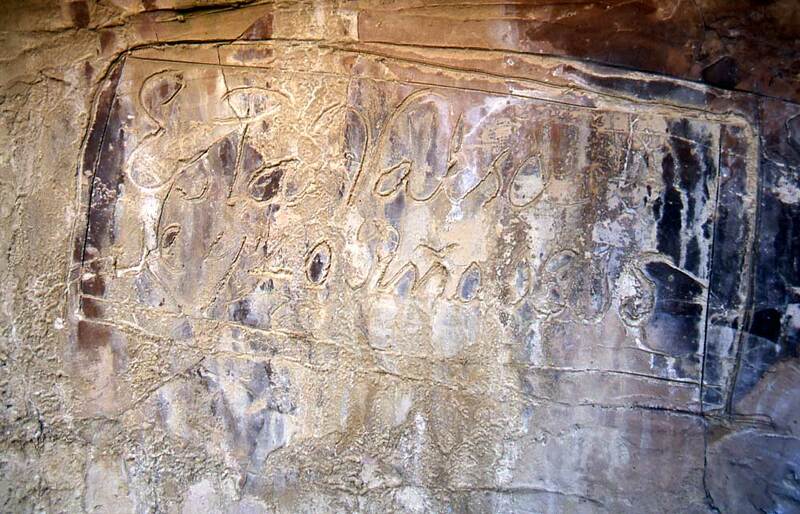 The inscription may well be rotten away. I've found a year on the main beam also, but I'm not sure what to think of it. The engraving is shown in pict. 18. 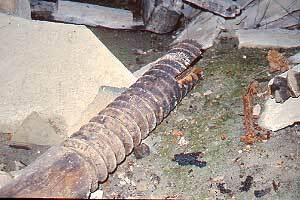 It is located at the side of the main beam of the press near the head end. 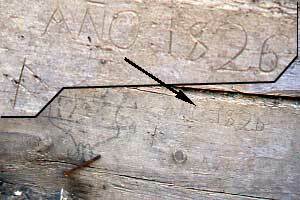 Some additional markings accompany the year. They very much look like try-outs: an incomplete letter 'A' and the single word 'ANO'. The shape of the numbers is different from the other inscriptions in the mill. 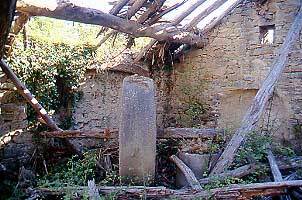 Though the artefact is very clear, I have no recording of it from our first visit in 1996. I may have overlooked it back then, but I feel that unlikely. So the question remains: is it a genuine date stamp? ‡ Manuel López Dueso —2006— Del siglo XVI al XVIII. in Severino Pallaruelo Campo (coord. ); Comarca de Sobrarbe: pag. 115-132. The book is freely available as a PDF at www.comarcas.es (Spanish). I keep a local copy of the article: M. López 2006 (PDF; 360KB). At page 130 the head of the press is shown. Obviously, the picture was taken before 1996. The environment is still rather clean and the caracol stands upright.